Eddie Royal has a knee injury. His return is questionable. Bad ball placement from Bridgewater becomes an interception and an opportunity at the end of the half for Chicago. That is the first interception by a #Bears DB this season. Kyle Fuller picks off Bridgewater, returns it to the MIN 34. 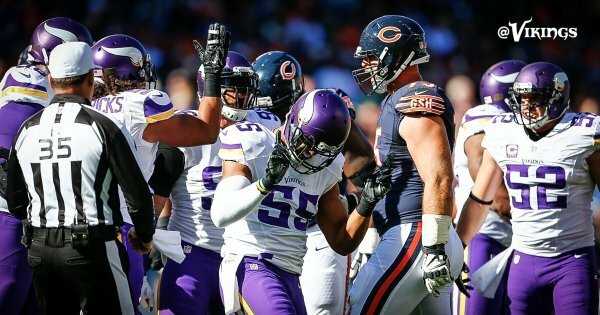 Teddy made that way too easy for Fuller. 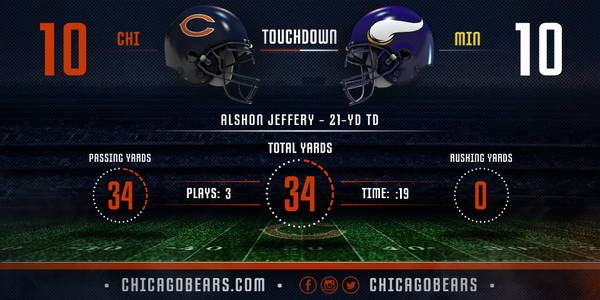 A @teddyb_h2o INT gives CHI the ball with 1:01 left in the 1st half. #Bears CB Kyle Fuller has a pass deflection and now an interception in coverage on Stefon Diggs. That INT is all on Bridgewater, Fuller in great position the entire way. That's an unreal catch by Alshon Jeffery in the end zone over Xavier Rhodes. Whoa. Cutler to Jeffery - 21 yds & 6 points. Alshon Jeffery with a hell of a catch over Xavier Rhodes to knot the score up at 10-10 just before halftime. DA BEARS!! !...we in trouble now! So Bridgewater's pick proves costly, as the Bears tie it up at 10-10 just before halftime. That was not bad coverage by Xavier Rhodes. Just an incredible catch by Alshon Jeffrey. Wow. Josh Robinson's thought bubble right now: "See, it isn't so easy to cover these guys." Tie game with under a minute left in the half. As first half ends, Bears fans in the stands at Soldier Field sound much happier than they did about 5 minutes ago. bench Bridgewater, he can't score you TD's and he does to many 3 and outs..
Wallace is the DUD!! $11million dollars worth!
. 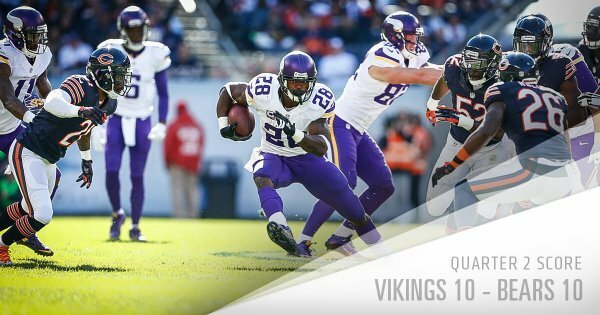 @AdrianPeterson halftime stats: 14 carries for 75 yards. A look at first-half numbers. The #Vikings are ready for the 2nd half! Back in action and marching down the field! 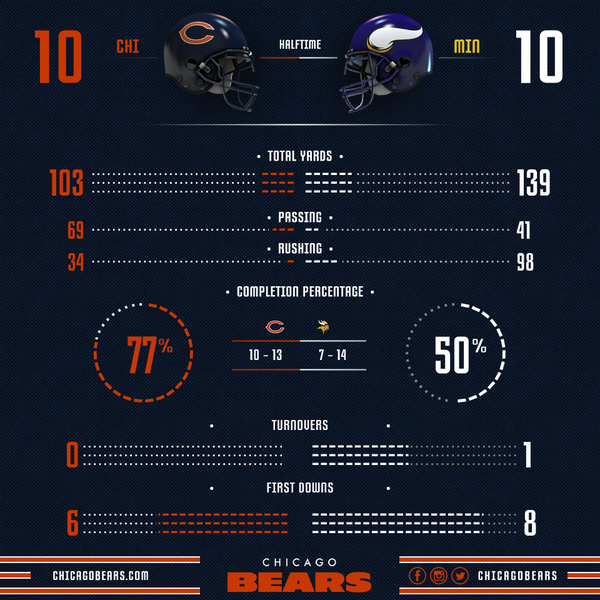 #Bears are at the Vikings 23 yard line.